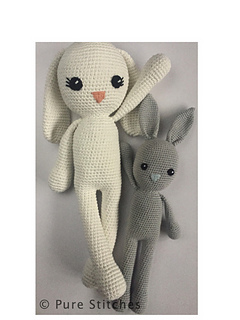 Hon’ Bunny is a cute and hugable, crocheted bunny - and comes in two sizes. From one pattern you can make a small Hon’ Bunny measuring app. 11 inches (28 cm) from head to toe or a large one in app. 15,3 inches (39 cm). Both measures are without ears. 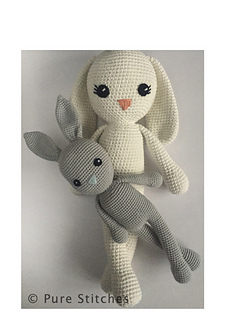 Using other yarn and appropriate hook you can make the bunny in what ever size you’d like. The pattern has been tested by other crocheters, who said it was an easy going pattern with good instructions. There is lots of pictures to help you get an understanding of the ongoing work. Please read the above carefully before purchasing, as these pdf files are non refundable. Do you have any other questions, feel free to contact me.